ETA: I guess it's OK if I add another milestone to this post :) I just found out that I was chosen to be today's Featured Stamper at SCS!! What an incredible honor this is and I'm still taking it all in! Thanks to everyone for all the VERY kind comments and a special thanks to my awesome friend, Tammy. A 100,000 hit milestone!! My counter rolled over 100,000 last Saturday, but as we were just getting started on MFT teasers for this last release, I decided to wait until today to start my celebration :) And, to show all of you who visit me how much I appreciate every visit and every sweet comment, I'm offering up some blog candy! To enter to win, just leave a comment. You don't have to work for it by answering a question, LOL! But you do have to leave me some way to get in touch with you if you win. If you don't, I'll have to pass over your comment when I'm putting the numbers through Random.org to chose a winner. OK, let's get to it! I'll choose a winner next Sunday, February 14! WOW IT'S MY TURN TO BE # 1. Congrats on the milestone hits. I always love to check you out and see what kind of creativity you are up to. Thanks for this chance to win a great batch of candy. I'd like to be the first to comment your valentine's card totally rocks! Thanks for the opportunity to win a prize too! Congratulations!! What an achievement to reach such a high level. Thank you for offering some candy and the chance to win this nice collection of goodies. I wish you many, many more hits on your blog!! Wow, that is so sweet. I don't care if I win or not, I just think you are so sweet just to want to share such beautiful gifts. I came here because you are our Featured Stamper on SCS and was curious about you and your work. I will be revisiting your gallery, though I am not much of a blogger, I enjoy visiting once and awhile. I do want to Congratulate you and wish you all the best for today and you 100,000 hits! So cool. Congratulations on 100,000 hits. Your blog always gives me inspiration. I especially like the template you've been making lately. The doctor bag and cupcake sets are just precious. Thank you for sharing your love of papercrafting with us. I was cruising over here to find my inspiration for the day and what a pleasant surprise. Congratulations on your Blog hits, as well as, being chosen for today's Featured Stamper. Hey, girl! Congrats are in order all around.....for all the blog hits AND for being today's FEATURED STAMPER! Whooo-hoooo! I love stopping by your blog to see your awesome designs. Well, today is a day FULL of congratulations! Congrats on all your hits and congrats on being the Featured Stamper at SCS today! What a great way to spend a Sunday, basking in all the glory! Enjoy your success, my talented friend! Congratulations on 100,000! I have truly enjoyed receiving your posts and looking at your art. Thank you for sharing with us, I can't wait to see what's coming. Hi, I just found your blog through SCS Featured Stamper Challenge. Congrats on being chosen-on my way back over to tour your gallery and choose a card to case! Congratulations on your milestone hits. That is exciting. Also congratulations on being the SCS featured stamper. Your creations are beautiful and I enjoy your blog. Congratulations Barbara. I look forward to your posting each day, as I'm sure many others do as well. You're very sweet to offer all those goodies! Have only just discovered you and your work but I'm already a huge fan! Congratulations and greetings from Ireland!! P.S would love the candy as its very hard to get such gorgeous stuff over here!! Congrats!!! Love to follow your blog and check out all your wonderful creations! Thanks for the chance at the blog candy! Congratulations on the milestones and being chosen stamper of the day .Your work is amazing and I visit your blog regularly for inspiration. Thanks for a chance to win this blog candy. Hi, This is my first time seeing your blog or your cards and I just want to tell you what beautiful cards you make.And I love your blog. I am new at this blog thing so mine looks a little empty. Congratulation's on being picked for this. Since finding your blog, I check it daily!! You are very talented and I enjoy seeing what you create next!! Thanks for this opportunity to win! I really enjoy your work.Keep it up. Congratulations on both that counter flipping and on being featured stamper! I can only imagine what an honor it must be to be chosen - I'm off now to check out your gallery to see what I can CASE! Thanks for the inspiration and opportunity to win blog candy! Roses to you, Bar, for being the FS on SCS!! You're very talented and I so enjoyed your beautiful blog and gallery! Enjoy your special week! Congratulations on your blog hits and even more for your Featured Stamper today! You do fantastic work, so it is greatly deserved. Congratulations on both of your milestones!! That is amazing and well deserved!! Thanks for the awesome candy! YOU ROCK ON MY GF!!! ROCK ON!!!!! Congrats on the FS and 100,000 hit milestones - my what a big day! Well deserved! Congratulations on your milestone! I love your work. Congrats Bar!! That's quite a milestone too my friend. Wouldn't you know it that Flopsey is the one MFT set I don't have and it's no longer in the store either. Congrats also on being the Featured Stamper too!! You so deserve the honor. You know where to find me, but I'll make it easy for you since you're going to get slammed with comments: kenratzloff@sbcglobal.net Love ya girlfriend! Congratulations!!! You have quite a lot to celebrate. I enjoy your blog and love getting an update when you post something new. Thanks for the chance to win some candy!!! Congratulations!! Great honor and a great blog! Thanks for the chance to win!!! Congrats on the milestone! Thanks for offering the fun goodies! Congrats on your milestone! I love you blog. Thank you for the chance for this great candy. WOW!!! 100,000 hits, what a special day! And, thanks for your generosity in offering such great blog candy. I'd LOVE to win! Congratulations on your milestone! I love your blog and find your work so inspiring. :) And thanks for the chance at some blog candy as well! Double congratulations!! It's wonderful to hit 100K visitors, but it's such an honor to be the SCS featured stamper! And no one deserves it more; way to go, Barb!! Off to visit your splendiforous SCS gallery!! Wow! Congrats on both the milestone and being the featured stamper! Thanks for the chance to win that awesome blog candy, too!! Great cards. A friend just sent me your blog to check out....... Into my favorites is goes. Congrats on the Milestone! Your valentine card is wonderful! Congratulations!!!!!! I've been a fan of your blog for a while now and I really love what you do!!!! Thanks for this super chance of winning such a cool candy!!!! Congrats on being Featured Stamper! What an awesome honor!! Thanks for the opportunity for blog candy too! 100K - now THAT's impressive!! Congrats on the milestone hits - I'm not surprised! And congrats on being the featured stamper - woohoo! Wow! is right, bueatiful gallery. I favored your blog, its the 1st time I have visited it. I was just looking in the gallery on splitcoast today. Wow just found you from SCS love your blog ya on 2nd cup of coffee already looking at your work!!!! Congratulations on 100,000 hits! That is quite the accomplishment. Have fun being featured! This is a day to remember! Thank you for the opportunity to win candy! Congrats on your milestones!!! I love your blog. thanks for a chance to win some candy. What a neat collection. It is so nice of you to offer this. Love your blog!! Congratulations on you blogging success and SCS honor. Thank you for the chance win these wonderful goodies! Congrats on the 100,000 (+) hits! And yummy, yummy candy! Hi, thanks ever so much for a chance to win. I read your blog regularly and am constantly inspired by your work, thank you. Wow - thats a fabulous hit count! thanks for the chance to win! wow! Someday I want to be as good as all you ladies that have blogs! I would love to start one, but until then I will keep enjoying the beautiful cards you all make! What neat blog candy! All of your cards are beautiful and so creative! Thank you for sharing them with all of us. I know I've certainly drawn inspiration from your neat creations! I love subscribing to your blog! I never fail to find something to stimulate my creativity but if I did, I would just case one of yours! I love your cards. Thanks for offering the candy. I can see many more of these blogaversaries for you! Congrats! I am new to your site but love your "love" card. Congrats on your milestones and I will be bookmarking your blog. I need all the help I can get in doing cards. How cool - that's a huge milestone, and shows there are a lot of savvy stampers out there checking out your work :-) Keep it coming, and thank you for the inspiration. Congrats on the 100,000 hits - you've a wonderful blog!! Congrats! You deseve the recognition. Your blog and your work ROCKS! Two milestones in one!!!! Congrats on the huge number of hits and being featured stamper. I'll have to go visit SCS to see what everyone's made from your gallery. I don't have an MFT stamps so I'd love to win your prize. Thanks for offering. Congratulations! It's a great prize and that MFT bunny is so cute. I really love what you did with the valentine card -- now I know I need to get the Nestie's heart die. Congratulations on being chosen FS! I am really enjoying cruising your gallery - what awesome work! Not sure if My comment went thru, so I will redo it. Congratulations on not one but two milestones! You deserve it, Your cards are always wonderful. Hi! Since I found your blog, I have to stop by everyday to see your beatiful designs! Congratulations for everything that you already accomplish!!! Congratulation on your 100,000 hits and being the Featured Stamper! I was wonder how you get the widget on your blog to count hits and the one that lets others know when you post. I just signed up for yours. LeAnne is right your cards are amazing! Love your work and your blog. Congratulations and keep up the good work. Let me say that the best thing that happened for me today was SCS - turning me on to your blog. I have just spent over 2 hours looking at your gallery and now nosing through your blog. Congratulations on your milestone hit. I am definately going to be part of your next milestone. Congratulations! Look at all the followers you have...and thank you for opportunity to win such cute stamp sets. I'm looking forward to what you will share with us all next. Congrats on your milestone. Wow, you must shake your head some days and pinch yourself. What an honour and compliment to you from all your fans. You are providing us with art, technique, quality and inspirational projects and cards. Appreciation is sent. CONGRATS or being chosen for the featured stamper( you deserve it) and for your hits. Great opportunity for wonderful blog candy. Congrats to you, your blog is so inspiring. What wonderful blog candy too. Thank you for the chance to win. Congratualations on the milestone on your blog. What an awesome honor to be selected to be the Featured Stamper for SCS. wow...congrats again on being the FS....so fun and your gallery is great! Fairly new to stamping, but love all your beautiful cards and projects. I am excited to try out some new things. Thanks for the inspiration! Congrats on BOTH milestones!! The Features Stamper is well deserved!! LOVE your work. Thanks for sharing the love!! Enjoy your week in the spotlight, Barb!!! You deserve every moment of it!!! Hugs!!! Congratulations on your followers milestone...great work. Love your ideas and the encouragement to do the same. Thanks for the blog candy offer. Keep up the good work! Congratulations for your 100,000 hits on your blog. I love all of your cards, you are so creative. Thanks for a chance to win blog candy too. Congrats on 100k hits!!! I love coming to your blog every day for inspiration!!! Your creations are always so pretty! Thank you for the chance to win too! I love that lil doc bag! That is sure to cheer anyone right up! Thanks for all the inspiration! and for sharing everything with us! I'm excited to be CASing one of your cards today! Can't wait. I keep coming back to your blog for all the great inspiration and wonderful art! I'm so happy for your double milestone! What a wonderful Milestone, 100,000 hits! How wonderful. Congratulations. I for sure can say that I have added to your hits and have learned so much from your work. Today's Love - Crazy 4 Challenges #23 is absolutely beautiful and really shows that you do not need to have an absolute red and white card for it to be a Valentine card. Thank you for the opportunity to be included in your Milestone drawing, I really appreciate it. Congratulations on the milestones. And what an honor to being chosen the Featured Stamper. I love your blog and you are an inspiration to me. Thanks for a chance to win this blog candy. CONGRATS on the milestone & on being the featured stamper on SCS today! Thanks for the great blog candy!! WAHOO!!! It's easy to see why you have so many hits - your work is WODERFUL!! Congrats! Doesn't surprise me you have so many visiting your blog - we all love your creations! Thx for the chance of winning and here's to many many more visitors! You have an awesome blog with so much inspiration! Thank you for sharing your talent. Congrats to you for both your milestones. Congratulations! Your creations are beautiful and full of elegance. Thanks for sharing your cards! Congraats on your milestone! I love your blog and your wonderful inspiration. 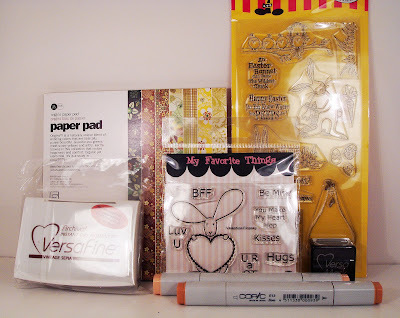 Thanks for the chance to win this fab blog candy! Congratulations! I love your cards and creativity. Yea! Blog candy! The only candy that doesn't increase my weight! Congratulations!! I'm so excited for you!! Congratulations on your "feature" and also on all the blog hits! Thanks for a chance for blog candy on top of the "eye candy". Love your site so much. This was where I got started with clear stamps and thats SO TERRIFIC. Would love some candy for sure! Congratulations on your milestone!! I love visiting your blog, the inspiration you offer is awesome! Huge Congrats to you Bar!!! So happy for your milestone as well as for being FS!! You rock friend! Love your blog! Congratulations on the milestone hits!!! Barbara, congrats on being selected for the "Featured Stamper" at SCS...I cased on of your cards for the challenge and I love your work!!! Wow, what a milestone, I was there for part of it. I check in all the time and you always have a new card posted. How do you do it? Thanks so much for such a generous prize! And thanks for sharing all your beautiful creations with us -- love your work! I really love your blog and all the inspiration you give me. Your paper flowers are just beautiful. I enjoy looking at your cards samples. I visit several times weekly for inspiration. Hope you keep going for a million hits! Congrats , Barbara on your milestone as well as your new DT status ! Very deserving! Wonderful blog candy ! I enjoy your blog and try to read it daily. Thanks for a chance to win some great candy. Thanks for the chance to win your candy. Congrats on your 100,000 hits. Congrats on reaching 100,000 hits. All your cards are inspiring. Thanks for the opportunity to win delicious candy. Congratulations on your milestones. Your work is so beautiful, just love to check it out. Thanks for offering that nice bunch of candy. Congrats! I'm new to finding your blog, and I have it bookmarked. Thanks for the chance at some great blog candy. Congrats on your hits! Love your cards, I enjoy visiting your blog. Thank you for the chance to win! I just ran across your blog this weekend and made a note to add it to my favorites once (if) my personal computer decides to behave. And now, today, I find you as a new member of FOF! Congrats on FOF and 100,000 hits! Thanks for the chance to win some great candy. Congratulations on your new venture. It must be very thrilling and well deserved from you showing of previous work. May the year just keep getting better. What a beautiful Valentine. Thank you for sharing your talent with us. And for the chance to win some yummy candy! Congrats on the milestone, I love your blog and all you inspire. Thank you for the chance to win some fab candy. Thanks for sharing all the great creativity. Congratulations on your milestone! Wow, what great blog candy. Just found your blog and love it - I'm going to become a follower for sure. Thanks for the great blog, you are inspirational. Congrats on your milestone. Wow, congrats on all your hits...LOVE your blog :)! Thanks for this chance to win some amazing goodies :)! Congrats! Love your work & your blog. Thanks for the chance to win some goodies! Good on you, I love your sunny easel card. Thanks for the chance to win. Way to go on your milestone! Great job on your new appointment. I love to check out your creations and am inspired to create my own. Thanks for the chance to win some awsome blog candy! I just discovered your site and beautiful cards and now you will be a regular on Flourishes. Congrats. Congrats on the milestone!! Love visiting your blog and seeing all the great things you make. Thanks for the chance to win some great blog candy!!! Thanks for the opportunity to win such a wonderful prize and congratulations! Congratulations!!! Would love to be the winner of this fabulous give away! Keep up the good work! CONGRATS! What an awesome milestone!! Congratulations! And thank you for the great giveaway! Hi, your blog is wonderful. I am intrigued by your ideas and will be using some...Congratulations on the huge milestone you have hit! Cheers to many, many more!!! I really appreciate the opportunity to win your giveaway. What big milestones! A SCS Featured person...big hits and more! The Valentine card is great and I enjoy your work. How kind of you to offer treats to one of us! Wow -Congratulations and what a spectacular accomplishment. Thanks for a chance in your drawing sweetie. Than you for the opportunity to win blog candy! I love those bunny ears! Good luck everybody! CONGRATULATIONS!!!!!! !Great blog and creative work. Thanks for the prize offer post! Congratulations on your milestone hits. Thank you for the stamping treats! Congratulations on the awesome milestone! Thanks for the chance to win! Congratulations!! Fantastic blog candy too! Congrats! You have a really nice blog, no wonder you have had so many visitors. *smile* Thanks for the chance to participate in your giveaway. Thank-you for the chance to win such a fantastic giveaway! Wow! Just wow. I am totally in awe of your talent. I just found you through Craft Gossip. I am so inspired to get my craft room finished and get started on all of my projects. I think I'll take a couple of your ideas and 're-purpose' them. THANKS! for the ideas and the opportunity to win some great stuff. I had to come visit when I heard you list your prizes as "candy". I may be on a diet, but your candy fits my NEEDS! Thanks for the fantastic blog and great giveaway. Congratulations on your 100K hits - that's wonderful. You do such beautiful work! Congrats Bar! Good things for good people! You deserve all the good things! Congratulations on your milestone Barbara. The best is yet to come. I appreciate the opportunity to win a prize. Today was my first visit to your blog. Love it. Congratulations are so in order. Proud of you. first time visiter but all I can say is wow! Congratulations and the opportunity to enter your drawing. love the stamps!! jessica d.
Wow...congrats on your milestone. I enjoy your blog and always love a chance to win some goodies. Wow - congratulations! I visit SCS for inspiration all the time, it's such a fantastic resource. Off to visit your work at SCS!! How awesome! Congrats and keep making it beautiful! So cute! Congratulations on both accomplishments! Oooo!!! Look at all those goodies!!! Congrats on the milestones!!! Quite an accomplishment! Jeepers.. today is the first time I ever came to your blog... courtesy of a link on Split Coast Stampers,and your projects are AWESOME! Thanks so much for offering crafters such wonderful projects... I'm off to make the little medicine bag now! And Congrats on your award! I Want Candy - My Favorite Things Teaser Day One! Flourishes' Birthday Blog Hop Celebration!